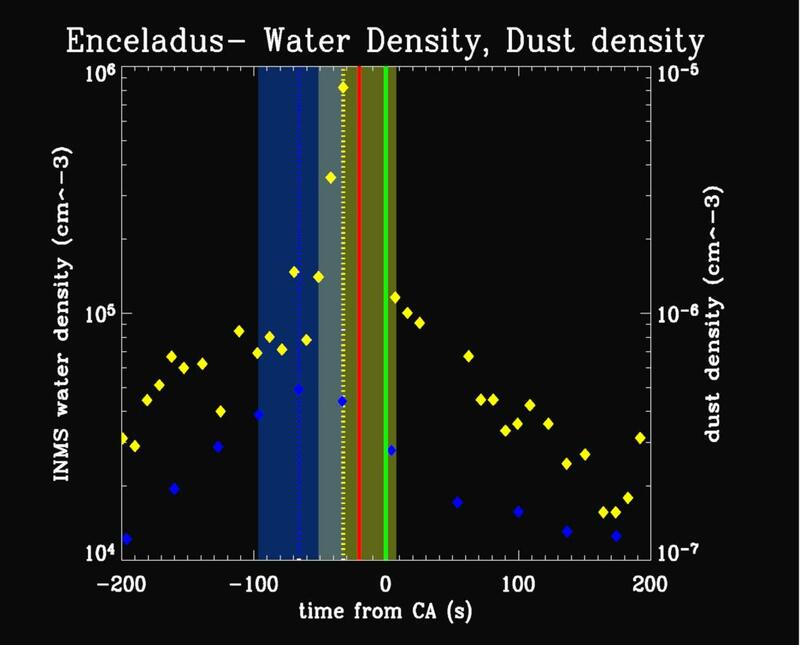 This plot shows results from Cassini's ion neutral mass spectrometer and cosmic dust analyzer, obtained during the spacecraft's close approach to Enceladus on July 14, 2005. Within a minute of that closest approach, the two instruments detected material coming from the surface of the moon. 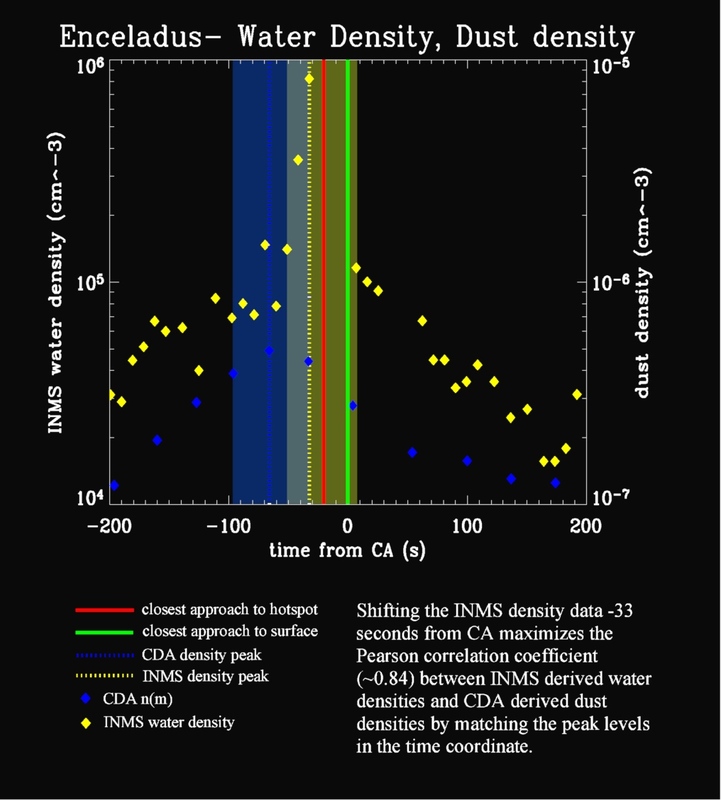 The ion neutral mass spectrometer measured a large peak in the abundance of water vapor at approximately 35 seconds before closest approach to Enceladus, as it flew over the south polar region at an altitude of 270 kilometers (168 miles). 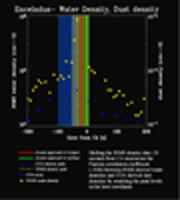 The high rate detector of the cosmic dust analyzer observed a peak in the number of fine, powder-sized icy particles coming from the surface approximately a minute before reaching closest approach, at an altitude of 460 kilometers (286 miles). The character of these detections is very similar to the venting of vapor and fine, icy particles from the surfaces of comets when they are warmed as they near the Sun. On Enceladus however, it is believed that internal heat, possibly from tidal forces, is responsible for the activity. The close but different occurrences of the two detections are yielding important clues to the location of the vents and even the venting process. The Cassini-Huygens mission is a cooperative project of NASA, the European Space Agency and the Italian Space Agency. The Jet Propulsion Laboratory, a division of the California Institute of Technology in Pasadena, manages the mission for NASA's Science Mission Directorate, Washington, D.C. The Cassini orbiter was designed, developed and assembled at JPL. The ion and neutral mass spectrometer team is based at University of Michigan, Ann Arbor. The cosmic dust analyzer is operated by scientists at the Max Planck Institute in Heidelberg, Germany.